A young treasure hunter in Britain found something unusual and valuable when trying his metal detector for the first time last year. Three-year-old James Hyatt was using it when, as he put it, "It went beep beep beep." Hyatt and his father started digging and Thursday they went public with their find, a 500-year-old gold pendant. Experts say it's worth about $4 million dollars. The BBC reports that they Hyatts found the pendant in a field and they'll share the money with the field's owner if the pendant is sold. The British Museum says the pendant weighs a third of an ounce and has a gold content of about 73 percent, according to the BBC. 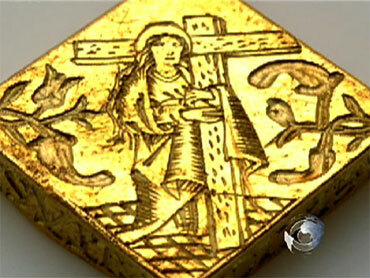 An image engraved on the pendant is likely the Virgin Mary. It is also decorated with the five wounds of Christ. The BBC quotes a letter from the British Museum, "Devotion to the blood and wounds of Christ was one of the hallmarks of late medieval piety."